To be honest, I haven’t yet had the time to analyze the charts of all the candidates to draw any conclusion of my own. That’s an enormous undertaking, which would require several hours to do well. The closest I have come so far is to ask a horary question back in April of 2012 when it became clear that Romney was the undisputed front runner for the Republican nomination. The horary was not conclusive and left me feeling that it would be a very close election in which Obama might just squeak by. If I had to quantify it, I would give Obama just slightly more than a 50% chance of winning based on this horary. My method of analysis may be a bit unorthodox, so let me give my reasoning. I assumed that the 10th house would represent Obama who is currently in office. The 10th is ruled by Saturn and has the PF within. Obama’s opponent would be the opposite house, ruled by the Sun with Mars within. The Sun is applying to an opposition to Saturn, which must symbolically represent the upcoming election when it becomes exact. The Sun (Romney) is traveling at its mean speed, is ruled by malefic Mars, and is in the terms of Mars. The Sun’s ruler, Mars, is retrograde, peregrine and slow in motion, as it approaches a station when it will come to a complete stop. Saturn (Obama) is fast in motion but retrograde, is ruled by benefic Venus, and in the terms of Venus. Saturn’s ruler, Venus, is slow in motion and peregrine but in slightly better shape than Mars. The Part of Fortune occupies the 10th house which represents Obama. All in all, the two candidates look evenly matched with perhaps a very slight advantage going to Obama, but not enough for me to feel certain of the outcome. If I had to put numbers to it, I would guess Obama 52-53% vs Romney 47-48%. 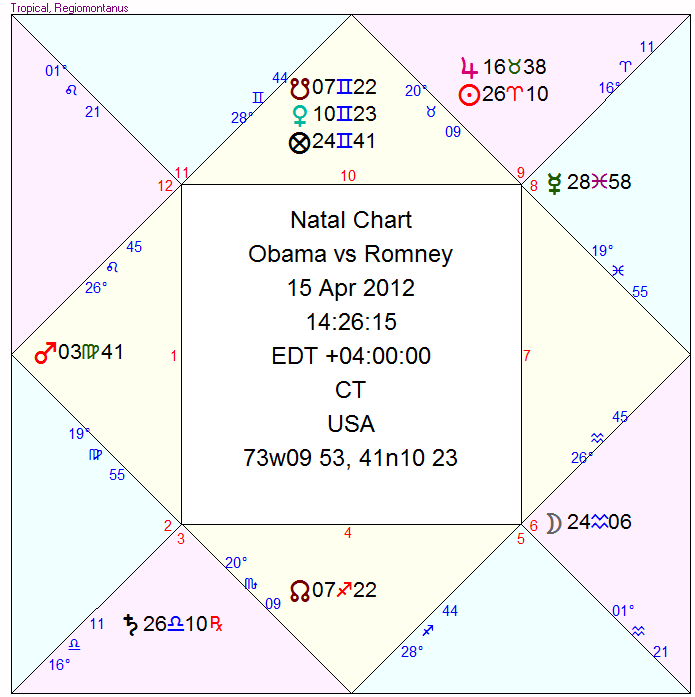 Obama vs Romney horary symbolically progressed to the moment the Sun/Saturn opposition become exact. Dignities for horary symbolically progressed to election day. In this chart the Sun (Romney) has moved into the terms of Saturn (Obama), giving the later a slightly greater advantage. With Taurus now on the MC, Venus rules the MC (the presidency) and continues as Saturn’s ruler (favoring Obama). The Moon, which is exalted in the MC, trines both Saturn and the Sun, suggesting a close election; but the Moon lies in the detriment of the Sun, so its trine to Saturn (Obama) is more favorable than its trine (from the Sun’s detriment) to the Sun (Romney). 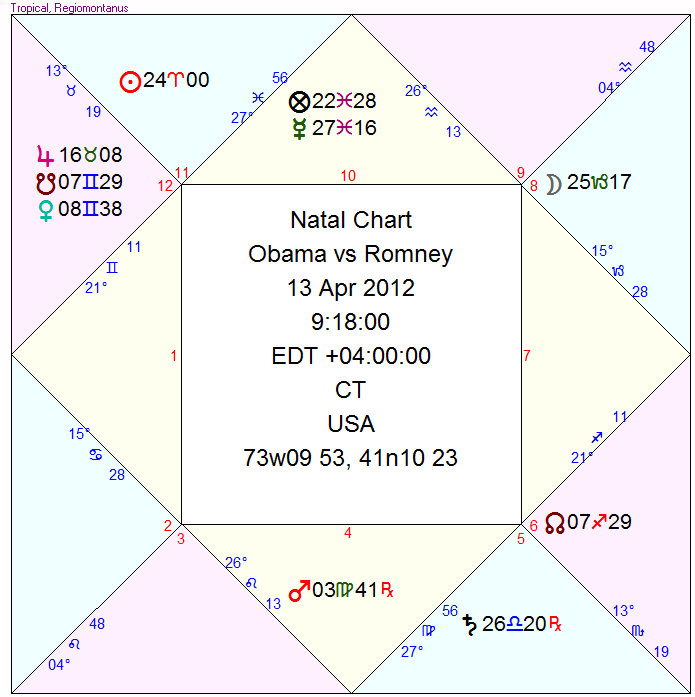 In addition, Saturn applies to trine the Part of Fortune in the 10th, which is favorable for Obama. The Sun (Romney) is separating from a sextile to the Part of Fortune, which is much less favorable the Obama’s trine. The result of the “symbolically progressed horary” is the same as that of the original: a close election which Obama is likely to win by a small margin. Addendum: After I posted this article, Jenny Brown called my attention to a post by Curtis Manwaring in which he uses the detailed methods of Helenistic astrology and the concepts of “eminence” and “releasing” to arrive at a very similar conclusion. He thinks Obama will probably win but does not rule out an upset by Romney. On the Traditional Astrologers page of Facebook, Manwaring added: ” I would say that I’m only at about 55% / 45% certainty on an Obama win.” On the other hand, in the same discussion Chris Brennan noted that Ema Kurent published a prediction that Romney would win based on her study of eclipses and that William Stickevers did a horary which predicted a win for Romney (together with some techniques of mundane astrology). On March 13, 1947, George Romney, a rising star in the auto industry who was often described as a man in a hurry, took time out to write to the relatives and colleagues he’d missed during the previous day’s blizzard of telegrams and phone calls. “Dear Folks,” Romney wrote on the letterhead of the Automobile Manufacturers Association, where he served as general manager, “Well, by now most of you have had the really big news, but for those who haven’t, Willard Mitt Romney arrived at Ten AM March 12.” The new baby was not the first but rather the fourth born to Romney and his wife, Lenore. Yet as the paragraphs flowed, and Romney detailed how precarious his wife’s pregnancy had been, it became clear there was a special level of wonderment embedded in this announcement, in this birth. Addendum 19 Aug 2012: It occurred to me to use the free Morinus software which does a nice table of comparative dignities and almutens. For these calculations I used the Egyptian terms, Chaldean decans, and the Morinus triplicities with all three triplicity rulers. I have come to favor the Morinus reformulation of triplicity rulers because it often gives better results in natal chart interpretations. 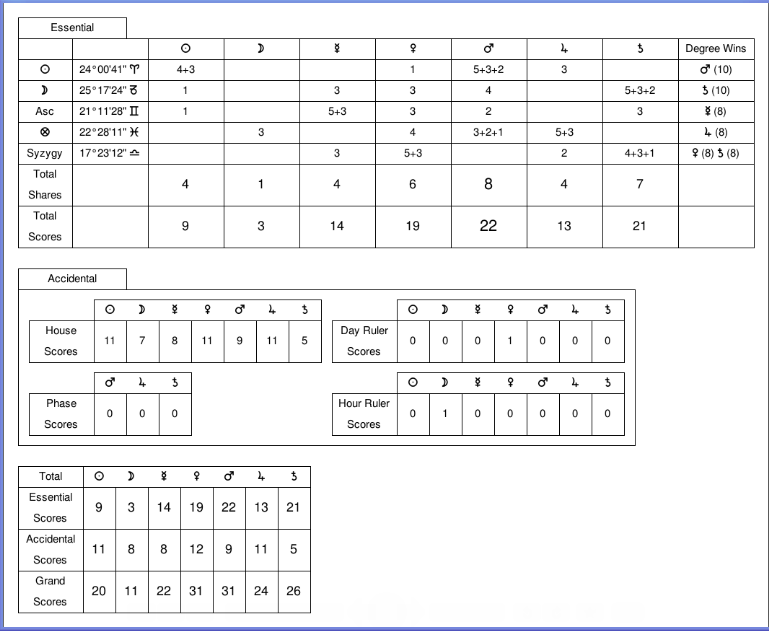 Below is what the Morinus software displayed regarding relative overall strengths of the planets in the original horary. Again Obama (Saturn) has a slight edge over Romney (the Sun). Comparative strengths of planets in original horary from free Morinus software. “One thing I think it is important to remember is that this is not really an even contest, Obama is already president, he just needs to not lose. Romney on the other hand needs to defeat Obama and win. A slight advantage to Obama, will get him over the line far more easily that a slight advantage to Romney. As to your horary; my rule of thumb is keep it simple and always take note of the Moon which is the natural significator of the course of events. Looking at your chart purely from a horary perspective and very simply; the Moon has separated from the Sun (Romney). His next aspect is to Saturn (Obama) by square with reception, after which he will carry his light to the MC ( signifying the high office of the presidency); which Saturn is next going to trine anyway, via retrograde motion, (symbolically a return). The Sun will not aspect the MC until after Saturn (in real time). So different astrologers have different takes. Some feel a horary cast by someone other than the candidates cannot be valid. Others feel that an ordinary citizen who will be affected by the election can ask a valid horary about it. And then different astrologers view the same horary in different ways and arrive as opposite conclusion. The good news is that we all have at 50/50 chance of being right! This entry was posted in Astrology and tagged Election 2012, Helenistic astrology, horary astrology, Obama, Presidential Election, Romney, Romney birth time. Bookmark the permalink. 22 Responses to Who will win the 2012 presidential election? Thanks for calling my attention to your post. Excellent article on the traditional approach of using the ingress chart to judge a mundane event. You come to a very similar conclusion to the horary I posted, which seems to have stirred a bit of controversy about what is a valid horary question. In my view the ingress chart is simply another horary chart whose timing is set by the movement of the Sun with the assumption that the moment the Sun moves into Libra will answer the question about world events in the following period. In any case, I found your article clear and understandable and would recommend it to readers of this blog. Thank you for your kind words and for the ‘like’. I have just added your web log to my blogroll. You are, of course, correct in your statement that an ingress chart is like a mundane horary chart and so it is not surprising that we came to similar conclusions. At the end of the day, there is only one astrology and the same rules must apply for genethliacal as well as judicial charts . (That’s why I never understood as to why some astrologers use different house systems for horary, natal, or mundane, but that is another can of worms entirely). It might be easier though, to use ingress charts for important mundane events, if only to circumvent the eternal discussions about the horary moment, radicality or validity. You raise interesting questions that astrologers have debated endlessly. I don’t view astrologer as having “rules” per se but only guidelines developed after long experience. Regarding house systems, I think it depends on the experience and personal tastes of the astrologer. I tend to use Regiomontanus for horary to be able to take advantage of the experience of Lilly and others of his era. I tend to use Placidus for Solar Returns to take advantage of the extensive research of Volguine in France who has decades of data based on Placidus houses with Solar Returns. It’s an open question whether the results Lilly or Volguine got and published would hold up if we switched house systems. I’ve also had the experience doing horaries of listening to the voice of intuition as I am about the cast the chart to use a particular house system. For example, I might be about the click on Regiomontanus but a little voice will say “use Koch” or some other house division. Invariably when this happens the intuited house, which comes unbidden, gives the most accurate reading. It would be nice if astrology were one of the physical sciences in which following the rules always produces the same correct answer. As the discussion of my horary on the traditional page showed, different astrologers — all competent and experienced practicitioners — can come up with opposite interpretations of the very same chart. In this case, the horary I posted has been read as meaning a win or Obama or a win for Romney, depending on which “rules” the astrologer felt were more applicable. To be honest, I don’t know who is right. The reason I wrote the post here was that the vast majority of astrologers are saying Obama will win. My reaction was to be suspicious of the findings. If all astrologers are saying the same thing, maybe the “gods” will give us the contrary result to teach us a lesson in humility. In any case, I have learned a great deal in this discussion and have clarified my own thinking about several issues. I appreciate your comments and your joining the discussion. Astrologers can take comfort in the scientific fact that we all have a 50/50 chance of being right about the November election. However, if Romney wins, a lot of us will have egg on our faces in November. not sure where tony has discussed this, but i don’t see it anywhere here.. i don’t know about coming up with opposite interpretations, but maybe this is so! if one means by opposite – some say obama will win and some say romney will win – i suppose that is a type of opposite, but i would say it is just a different interpretation..
i read the other day how horary wasn’t done in hellenistic times which has a focus given the contemporary readings of using whole sign houses… i thought it was an interesting thought to ponder.. just how relevant house systems or horary or any other technique or tool in use for an astrologer is relative to the amount of benefit – whatever kind – to the person doing and receiving the astro insight/prediction – what have you.. if astrologers are to learn from one another and grow – they need to be exposed to different ways of doing astrology, as opposed to getting stuck in a particular approach..
think of the destination and how we can arrive at the destination a number of different ways.. aside from the joy involved in travelling, the focus is mainly on the arrival for many who want to get something from astrology – will i win?, will i get better? is this relationship the right one? and etc etc.. what house system or technique an astrologer uses ought not to matter if they are able to provide an answer to these questions that have a high rate of success.. a low rate of success and the astrologer might want to reassess their approach!! now we have numerous astrologers giving a particular rationale for who will win the election.. does this mean those who get it right have the best approach and those who get it wrong don’t? i am not so sure about that, but it is fun to watch and continue to learn of all the choices astrologers have to make fools of themselves, or look prescient. it is almost not much different then the tossing of a coin!!! Tony, you are, of course, right that astrology has rather guidelines than fixed rules, although this should not absolve the beginner from having to get to grips with the astrological basics first. Once the basic patterns are understood, the practitioner can use endless variations of a general theme, so to speak. You are saying that you use Regio for your horary work and Placidus for solar returns, which is fine, because both are part of their individual coherent systems, but I doubt that you would use, let’s say, the Whole House system for horary instead. I am mainly working with early modern astrology, whereby Lilly is my eternal hero, and so it comes natural that I do not deviate from using Regio. I wonder if so many astrologers experiment with different house systems because they can, thanks to ever more sophisticated software on our computers. Even if some of us claim that they are working purely in the tradition, I doubt that this is the case. Lilly cast one chart at the beginning of his working day, and after he had finished his lunch, he sent a boy out, to look at the big clock to find out what the exact time would be. Then Lilly would correct his horary chart to serve his afternoon lot of clients. Not much point there to try out different house systems, I would say. Nowadays we argue if we should cast our horary chart immediately after we opened a client’s email or if we could perhaps have a cup of tea before hitting the print button. It is very interesting and intriguing to read what you have to say about your use of intuition. This does remind me of the Company of Astrologer’s approach and I think I can remember you talking about Geoffrey Cornelius’ “Moment of Astrology”, which is a truly fascinating book, dealing in great detail with these issues. Also very much of interest here is Dr. Ben Dykes’ “Search of the Heart”, wherein he discusses the so called ‘consultation charts’. These were charts, cast before the actual consultation, giving the astrologer an insight into the real questions and interests of the client. He shows that many astrologers, ranging from Sahl and Masha’allah to Leopold of Austria and William Lilly, probably used this technique. In the end, even if Romney should win, I would not see this as a defeat but only as an opportunity to learn and deepen our experience. I haven’t made much use of consultation charts though I have no doubt they could work. Basically they are horary charts where the question is what is on the querent’s mind for which he or she seeks a consultation with the astrologer. Along these lines I sometimes pull a tarot card before a meeting to see how the themes that arise in the meeting will reflect the symbolism in the card. It is a fascinating exercise that has taught me a lot about tarot symbolism. I also haven’t done much with whole sign houses though there is a strong tradition that supports using them. Besides Lilly, my astrological hero is Morinus for his exquisite logic and incisive analysis. Morinus, like Lilly, favored Regiomontanus houses. In Morinus’s case he thought Regiomontanus was the correct system because it was the only house system that revealed how truly brilliant he was as a person. There is one passage in Morinus where he very much wants Saturn to be in the 9th house but finds it in the 8th Regiomontanus house. His solution is to say the Saturn is “accidentally” in the 9th house, as I read it, because Saturn is in the 9th sign from the ASC, that is, in the 9th whole sign house. So although Morinus rejected whole sign houses, he found himself resorting to them when circumstances demanded it. My personal experience with whole sign houses goes way back to when I was first learning astrology. My own chart has no intercepted signs in houses, so that each cusp has a different sign. When I was first studying astrology some 50 years ago, I kept a journal in which I tracked the transiting planets, where they were in my chart, and any events that correlated with those transits. After a while a pattern emerged. I was expecting events related to houses as planets conjoined the cusp and entered the house. Instead, I found that events related to the house occurred when transiting planets entered the zodiacal signs on the cusps even though technically those planets were in the preceding house by 10 or more degrees. This was not supposed to happen but I had lots of evidence that it was happening. For example, the day the Moon entered Scorpio, the sign on my 2nd house cusp, I often had to go to the bank for do some financial transaction, even though the Moon was “officially” in the middle of my 1st house. Then I realized that the entire signs were acting like houses, so essentially I was confirming the validity of whole sign houses without realizing it. Many astrologers assume there is a true or most accurate house system and we have only to find it. It seems unlikely to me that this is the case. House systems are just different ways to slice the pie, and sometimes one type of slicing is more appropriate to the occasion that at other times. In addition, houses are huge chunks of 4-dimensional space-time and the cusps we see on our maps are but overly simplistic projections onto 2-dimensional space. A lot probably gets lost in the translation. thanks.. looks like one has to be a member in order to read the content..
ASC Primary Direction=1°22′ Leo= 4 Nov, 2012, Saturn Transit Square, and Conjuntion Solar Moon!!! ASC Solar Return=2°30’Aquarius oposite Saturn Rx!!! The Demi Return Moon before the elections, has Mercury square Neptune, this indicates confusion and delusion.. I am aware your a horary authority but as a mundane specialist myself I have to say I am no enthusiast for using horary charts for mundane questions. Establishing a strong connection between the querant and quesited is always crucial in horary. I personally think unless you are working for the Obama or Romney campaigns or they come and ask you a question as the astrologer I question the legitimacy of such charts. I am a moderator on Skyscript website and during the last Presidential contest we had ‘horary war’ with some claiming their question favoured Obama while others put up a chart that appeared to favour John McCain. I can see your logic. I suppose Obama is your leader and therefore as an American citizen you have a connection ( however tenuous) to him. Its much easier doing this when you have an incumbent President. However, you dont seem personally that strongly connected here. Its an interesting topic for discussion though! I agree in principle with you that horary is not the best technique for judging mundane events. As you point out, a strong personal connection with the matter is often important to coming up with a radical chart. It does not surprise me that results would be about 50/50 in a “horary war” about who will be the next president or who will win a presidential election. Valid horaries depend on the matter being of pressing personal concern to the querent. The idea that the querent needs to be personally involved in a matter is not the same as the querent having an abiding personal concern. A good example is Lilly’s question (CA p 419) about “what manner of death Canterbury should die?” (he was beheaded by the sentence of Parliament). Lilly states that he never made the acquaintance of the deceased yet he appears to have asked the question because there was much in the news about Canterbury at the time. Who is justified in asking a horary question about someone’s manner of death? This is a question worth pondering. Try telling the mother of a British solder who was killed in the Iraq war, illegitimately waged by Bush/Cheney, that the election of Bush was not a matter of deep personal concern for her. Romney is a chip off the old Bush/Cheney block. I did not make clear in the post how this question came about. I did not set out to predict the outcome of the election. The idea of posting the horary hear was an afterthought that came many months after the horary. I am deeply concerned about this election. I am about to retire from work and the policies of the newly elected government will profoundly affect my well-being and that of my children for many years to come. I had been following the primaries very closely and only when it became clear that Romney would be the Republican nominee did I begin to wonder whether he would be elected. One day when I was feeling deeply concerned about my own future as an American citizen under a potential Romney presidency it occurred to me to ask the horary question to allay my anxiety. My own political view is that Romney represents a return to the Bush/Cheney policies that got this nation into the current mess. The horary chart was very equivocal, as you can see, and I did not see a clear winner. It seemed to me from the horary that the election would be extremely close. I thought I saw an Obama win by a very slight margin, but I was not sure whether that was wishful thinking on my part. My motivation for the post was to get some feedback about my horary analysis to see whether my own thinking about the chart was on target. This horary appeared radical to me because it seemed to describe well the situation in the United States. It continues to seem radical because the election is turning out to be extremely close and hard to call as the horary predicted. Over the summer it seemed like Obama had an insurmountable lead, but now the election appears like it could go either way. I am hoping that my original interpretation is correct that that Obama will remain in the presidency. If he loses, I will not be surprised because the horary was very difficult for me to judge and I was uncertain that I had done a correct interpretation. The horary represented a chart that was also almost “too close to call” just as the election is today a week before the polls open. Since I did the horary, I have also spent time doing chart comparisons between the candidates and the swing states. These comparisons also give Obama a slight edge, which is consistent with my horary, again suggesting that it is a radical chart. If someone were to ask me a horary question about who will be the next president simply because they wanted to know or wanted to publish the findings somewhere, I would not accept it as a valid horary. If I were convinced that the person had a deeply abiding personal concern in the matter, I would do the horary and expect a valid answer. I was asked if I had done a Horary for this USA election, but have been so busy with my own country it slipped my mind. I am from South Africa and we are having interesting political times here. So I set the question for 11 30am today when the question was asked. For any Astrologers interested the details are 3/11/2012 2 11 30 am, Johannesburg, South Africa. ASC 10 degrees 9 mins. As I see USA as a foreign country L6 was Obama and L12 Romney. A challenging chart, The Moon at 0 degrees Cancer is Obama just entering his sign and the sign on his house cusp, the fixed Star Sirius a benefic, fruitful honorable star on the cusp of the 6th. Romney L12 Saturn is Combust the Sun, Sun separating from Saturn but never the less combust. The malefic fixed star Manubrium is on the cusp of the 12th house. He is also in a fixed sign, early degree of 3 so seems he is staying where he is. The major testimony in this chart goes to Obama….now it is interesting how after the “Sandy Crisis” Obama has managed to regain some support, the Moon his significator has just changed into its own sign, it is like he has come back into his sign and back in favor. So Anthony I am in agreement with your testimony, this is such fun it make elections and sport very exciting. Thanks. We will know soon unless there are election irregularities with mercury retrograde.